The annual Instant Play Festival (IPF) is right around the corner, and with that, Harper Joy’s walls are gladly hosting three guest playwrights who engage with not just student playwrights for the community-wide festival, but the Whitman Community at large. 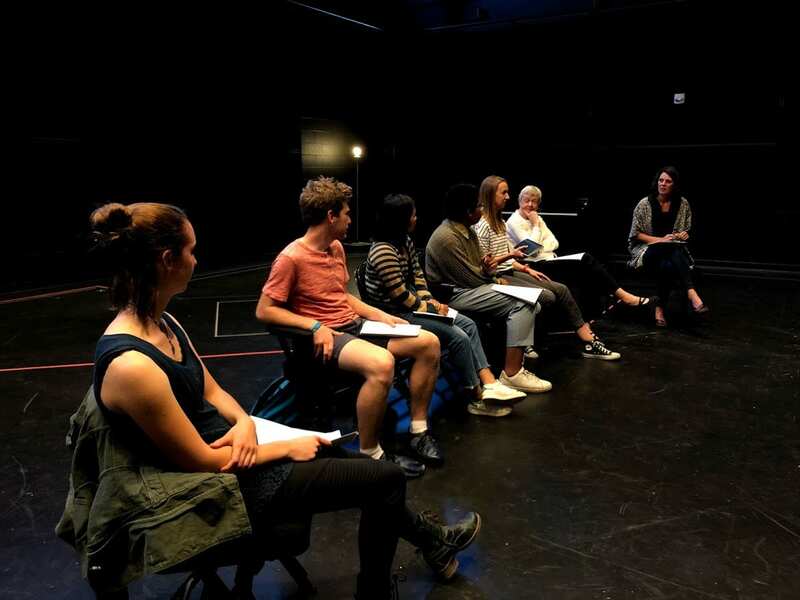 Last week, lauded playwright Mia Chung led an open rehearsal to workshop her newest play Catch As Catch Can. Student performers joined other students, faculty, and community members around a table to focus particularly on scene 5. After a few read throughs, Mia extended an invitation for attendees to give their input about how to solidify a moment between two characters and the audience’s understanding of it. Mia Chung’s Catch As Catch Can rehearsals begin at the end of September, with previews beginning October 22nd and opening night on October 31st at the New Ohio Theater, New York City. This past week’s playwright, accomplished Emily K. Harrison read the first 9-10 pages of her production Slab, an adaptation from a novel about Louisiana during the post-Katrina crisis. Slab will be making a reappearance in theaters across the U.S., so the production is in the process of the being altered slightly and trimmed down, highlighting to young writers that the writing process does not necessarily end after a show has been produced. During the Q & A section, an interesting discussion about the implications of where to perform a production, particularly location-specific productions about devastation, ensued. Further topics of collaboration with other artists on production projects were also discussed. Next week, Harper Joy will host our last guest artist for this event, Seattle-based playwright and founder of Seattle’s shadow puppet troupe, Scot Augustson on Thursday, September 20th. Buy your tickets now for Whitman College’s Instant Play Festival, a 24-hour event where 7 brand-new plays will be written, directed, and performed, on either Harper Joy’s website or at Harper Joy Theater Box Office on Whitman College campus open M-F 12-4PM.